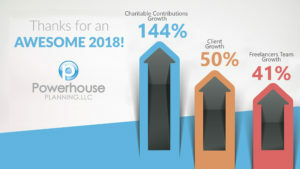 Powerhouse Celebrates a Fantastic 2018! There’s really no other way to describe it. Our clients and team members made 2018 a celebration here at Powerhouse Planning. 2018 saw us enjoying our sixth year providing an assortment of services to a wide range of clients, while employing a virtual team that now represents all five military branches, the best talent (regardless of military affiliation), and eleven states (if you think your office conferences are hard to coordinate, try ours!). 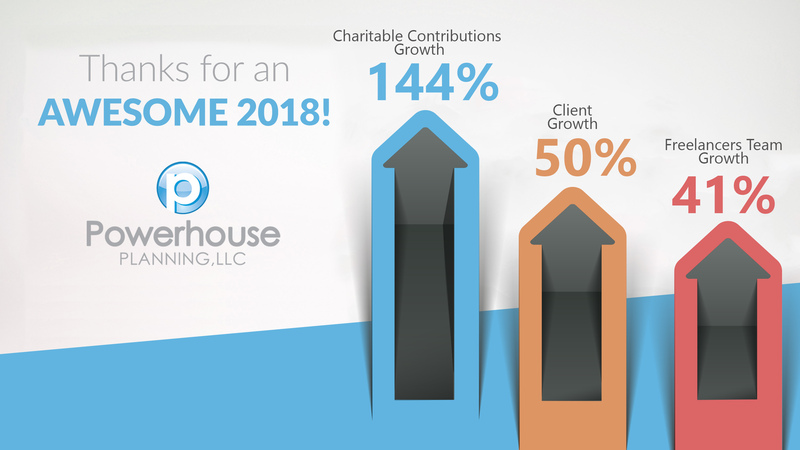 Despite a fabulous first five years, in 2018 Powerhouse grew our client portfolio by 50% and our team by 41%. In addition, our most impressive statistic is also one near and dear to our president and founder, Jessica Bertsch’s, heart: Our charitable contributions grew a whopping 144%! So join the party as we honor the ways in which 2018 marks our most “accomplished” year to date. Our clients are incredibly important and impressive. We strive to provide the best, most innovative products, and word is spreading that Powerhouse is the place to go for high-quality, on-time delivery. In 2018, we established partnerships with Jacey Eckhart, Coastal Addiction, MILLIE, and Operation: Job Ready Veterans, just to name a few. From serving nonprofits to government contractors, we provide wide-ranging services that assist our diverse clients in creating the best possible solutions for their clients. In addition, we are proud that longtime client Cape Henry Associates renewed their contract with us for a record fifth year. Ever heard the phrase, “There is no ‘I’ in team”? Well, at Powerhouse we’re proud to say that we place a high premium on collaboration and teamwork—it’s all about working together to create our POWERful team solutions. But we do believe there is an “I” in our team: Our team is INCREDIBLE. All of our team members are truly spectacular at what they do. Our president has a talent for discovering someone’s “career gifts,” and it shows in the team she’s assembled. Last year we added some dazzling talents to our team such as Meghan Traynor, Julia Clark, and Ariana Detrez. Powerhouse has been honored to work with some of the best talents in the nation. In a virtual workplace, it can be difficult to create a true sense of community, but Powerhouse has succeeded. While a lot of us here are relatively new (two years or less with the company), there are some who, even in the short six years Powerhouse has been around, have already achieved “legendary status.” Legends like Jennifer McKee, Technical Writer and Quality Assurance Specialist, who is our most senior team member. Jennifer has been with Powerhouse for five years, and her fingerprints are all over the successful projects we turn out. Another example of our spectacular workforce is Bianca Strzalkowski, our e-Newsletter Coordinator. All those newsletters you’ve received and looked at over the last three years are her babies. She makes us look and sound good year-round. From our amazing long-term IT guy to our lineup of graphic designers, technical writers, marketing gurus, and more, Powerhouse employs the best while providing a work/life balance that is second to none. No wonder our team members tend to stick around while continually submitting outstanding work. From its inception, Powerhouse has been committed to giving back 10% of its monthly profits. In the beginning, that commitment meant sponsoring a child in Africa through World Vision, a sponsorship that still continues today. As Powerhouse grew, so did our charitable offerings. In early 2018, Powerhouse provided funds for a woman to travel to Haiti for humanitarian reasons. Powerhouse’s founder wanted a way to get the team involved in our “Share the Goodness” movement, and in November and December she challenged Powerhouse team members to nominate organizations in our hometowns to receive some of the goodness that comes our way. Our commitment to give back to our communities saw contributions going to the Scentsy Buddy Drive at Florida Hospital for Children; Space Coast Basket Brigade; Jesse Beckius/Casey Owens Veterans Resource Center; Alzheimer’s Association; Foodbank of Hampton Roads; North Carolina Center for Economic Empowerment and Development (CEED); Onslow Women’s Shelter; Fort Gordon Christmas House; St. Anne’s Child Care Center; and Rockledge Professional Firefighters Charitable Foundation. If you asked her, we’re pretty sure Jessica would say that besides the professional success Powerhouse has seen, the ability to give back and “Share the Goodness” is one of her favorite things about starting this company. So, as we begin to tackle 2019, we thank you for everything. 2018 was a fantastic year, full of growth and exciting new partnerships. Be sure to check out our services. And keep checking back—we’re adding new goodness all the time as we strive to be the one-stop shop for all of your planning and marketing needs. Don’t see what you need? Contact us and we’ll see what we can do. Our goal is to make 2019 even more remarkable. Let’s make a date to meet next year to celebrate again—same time, same place. Deal? Whether it’s January 1st or December 31st or any of the days in between, there’s never a bad time to set business goals for yourself and your company. Businesses are living, breathing entities. They change and grow, or they die. And what breathe life into and give direction to a business’ future? Goals. But not just any goals—goals that are realistic and attainable. So how do you set realistic and attainable goals? Be (brutally) honest. How has the past business year been for you? Revisit both your successes and the times your company has fallen on its face. The things you rocked and the things that got away from you. Where did you knock it out of the park? How did you misstep? Both your successes and your failures can (and should) inform the path moving forward. Learn from both. Do your homework. What’s the latest, greatest in your industry? How is the way people do business in your field shifting? What are your competitors and peers doing that’s working? Not working? How is customer behavior changing and how might that impact how/where you find and engage with them? Setting yourself up for success in creating and meeting goals starts with you arming yourself with as much information as possible. Be SMART. The philosophy of SMART goal setting isn’t new; it’s been around since the 1980s. Its staying power is because it works. You want your goals to be specific, measurable, achievable, relevant, and time-bound. involved? What are you trying to accomplish? When will you do this by? Where are the relevant events/locations? What obstacles might you face? And the most important question—Why is this a goal that matters? Measurable – How will you know if you’ve reached your goal? What metrics will you use? Dollars spent/earned? Number of sales, customers, locations? 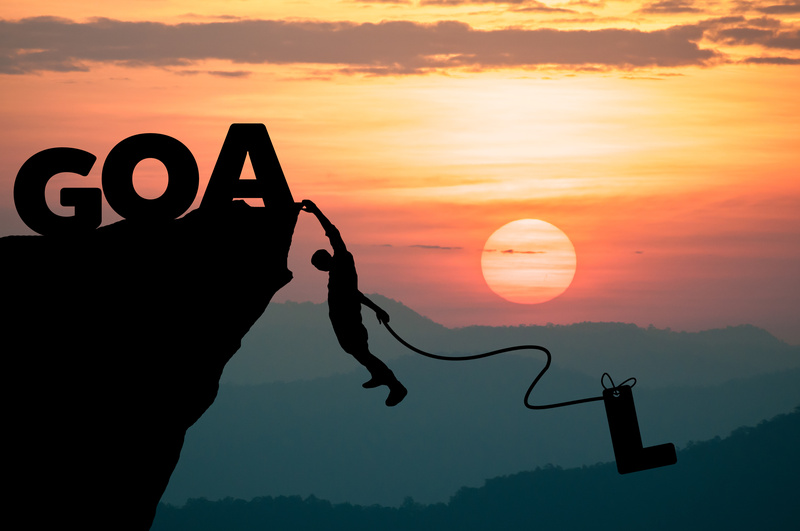 Achievable – Can you realistically do what you’re setting out to do? Do you have the skills, time, and resources? If you don’t, can you acquire what you need? Relevant – Does the goal align with your business plan/strategy? Just because you can do something doesn’t necessarily mean it’s a good use of your time and attention. Does it make sense to your broader vision for your business? Time-bound – Remember when you just asked yourself when you’d do this by? (See above.) Set a deadline or target date, not just for your goal, but also for all the milestones along the way. For instance, if your goal is to bring in 100 new customers by the end of the year, where are you at three months in? Six? Nine? Not only should you have a deadline for your goal, but you should also be monitoring your progress toward that goal year-round. That gives you the opportunity to assess where you’re at routinely and to make any adjustments as necessary. Get your team involved. The view from a leadership role is not necessarily the same as the view of the people taking calls, knocking on doors, fielding complaints, or working the systems you have in place. Sure, if you’re a great leader, you’ve got your finger on the pulse of your business. But you’re likely not interacting with customers and vendors, etc. Ask the people who are working the plan. When your team responds, don’t just listen—commit to making changes to the things that need to be fixed. And this commitment doesn’t just apply to the troubleshooting part of your business. Ask your team members what their hopes and dreams are for the company. What their brilliant ideas are that might just take your business to the next level. When team members have buy-in, they will work harder for a company that values them and solicits their feedback. Have a plan for your plan. Written goals are great. Know what’s better? The plan to implement those goals and the follow-up along the way. What will it take to get those goals off paper and have them work to grow your business? CRM system that manages information regarding customer engagement. Joe is communicating with team leads monthly for updates and feedback. Sarah is coordinating the celebration lunch if you’re on target with your numbers. Whatever the goal is, someone should be tasked with taking responsibility for each piece of the puzzle. Put it on your calendar. When are you meeting to check in with each other and report on progress/obstacles? When are reports due? What’s your deadline for meeting your goal? When’s that celebration lunch? Put it all on the company calendar where everyone can see what’s being tracked and by when. Scheduling time for such things conveys the urgency and priority of your goals to your whole team. Allocate the necessary resources. 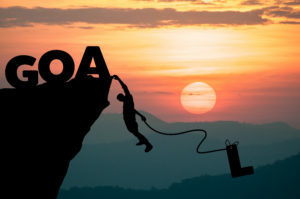 What do you need to set your goals in action? Budgeting more money for social media? New equipment or software? Specialized training or a staff retreat? Employee incentives? More employees? Look at what you’re hoping to accomplish and assess what resources will be required to make it happen. If you can’t find or create what you need to pull it off, perhaps this isn’t the time for this particular goal. If that’s the case, put it on your goals bucket list and go back to the drawing board to determine what’s possible with what you have available to you. Big dreams. Little steps. Dream the biggest possible dreams. Want it all for your business and believe that all is possible. But a goal isn’t a dream; it’s the vehicle that turns dreams into reality. The trick is to create goals that are bigger than where you currently stand, but not so big that you’re done before you’ve started. So be honest with yourself. Do your homework. Be SMART. Get your team involved. Plan to work your plan. Put the necessary resources in place. And get to work on those attainable and realistic goals that are going to propel your business ahead. Need some inspiration for where to start with your goals for a new business year? Click here.